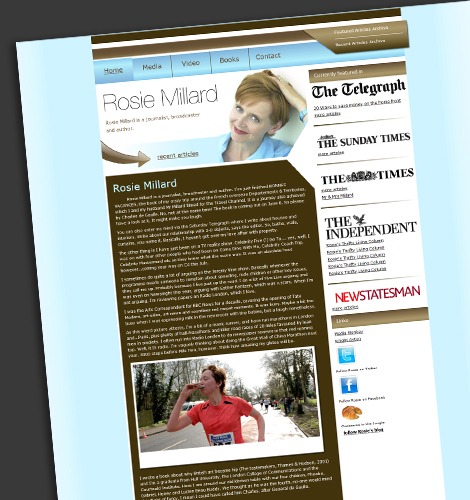 When designing Rosie’s new website we liked the idea of including the ‘Currently Featured in’ section which was on her old website, this is now featured throughout the side panel of her new website, we have also made the logos clickable which allows people to easily visit specific pages of newspaper websites which list the articles she has written. An aspect which Rosie was keen on enhancing from her old blog was her use of images – she wanted imagery to be heavily featured throughout her blog and so we cleverly designed her blog page to show a series of images from different blog posts beside one another. 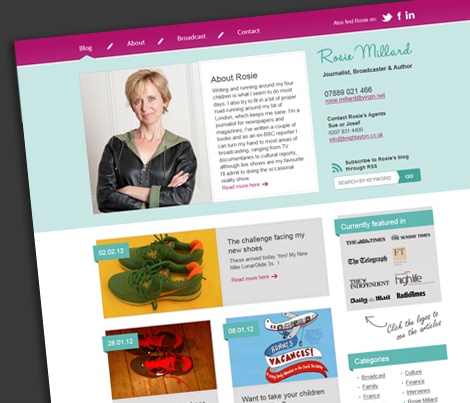 Rosie’s new website is now vibrant, contemporary and friendly as well as being very professional. 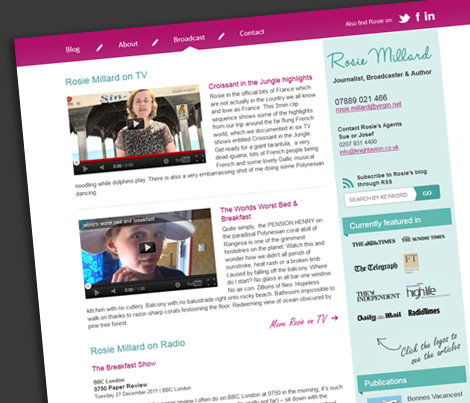 It effectively promotes her writing, journalism and shows her video and radio performances.We’ve created an interactive Broadcast page which allows Rosie to easily upload videos, and radio features which can include links to sound clips. “If you’d like to have a brand new website or simply inject fresh life into your current one then Nichaela Thompson at Top Left Design is your woman! Nichaela took my creaky old website, plus a blog, which was so old it almost predated the iMac, plus another website, and redesigned them all into a brand new Millard web experience. Visitors to my site can now find out about me, contact me very easily for work (that’s the idea), read my blog, read my second blog and find out what I am up to on Twitter, LinkedIn and Facebook. Essentially its a one-stop shop. Nichaela also imported lots of exciting new toys, such as Google Analytics, which tells me how many people are visiting, and where they are from, and put in no end of dynamic devices such as radio and TV clips. She also showed me how to do it myself in an hour training session which comes with the package, plus gave me the assurance that she would be there on the end of the line in the unlikely event of meltdown. Since the site went live, I’ve had loads of fantastic feedback, not least from my 14 year old daughter who pronounced the website as “OK” which means it is excellent, modern and hits the spot. 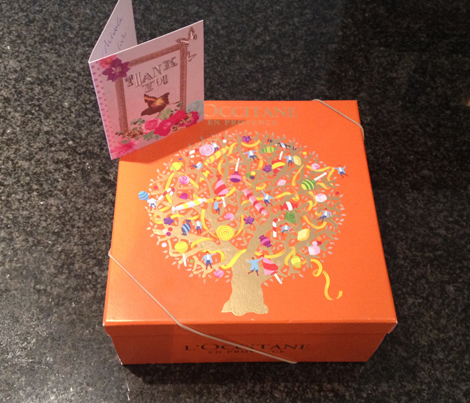 Rosie was so happy with her website that she even gave me a lovely thank you present! 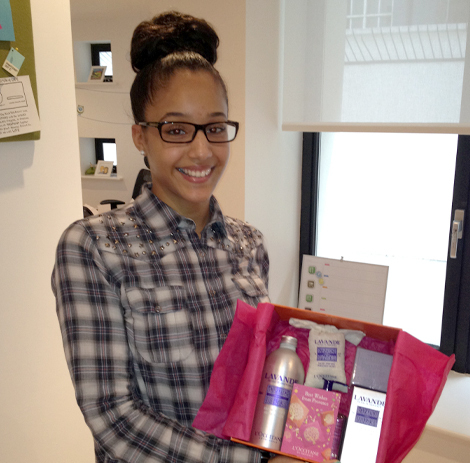 Thanks Rosie – these little bath treats went down well in a hot relaxing bath! Visit Rosie’s new website and take a look around. If you like Rosie’s new website then you should see what she has to say on Twitter. As an added bonus we even created a professional twitter background for Rosie!